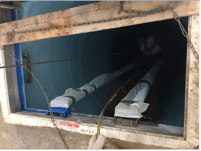 A new 22’ deep 6’ diameter precast concrete lift station that included the lining of a new precast concrete surface with Raven 405 FS Fast Set Epoxy spray applied at 125 mils DFT. 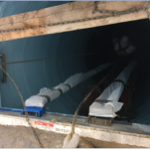 The epoxy lining was specified to prevent future I/I and to protect the concrete from corrosive gases from H2S & a soda bottling plant upstream. This lift station was a replacement from a previous structure, which failed due to the waste stream from the soda plant.